Luci Wilden is the owner of Knots & Vibes a handmade crochet label based in London. 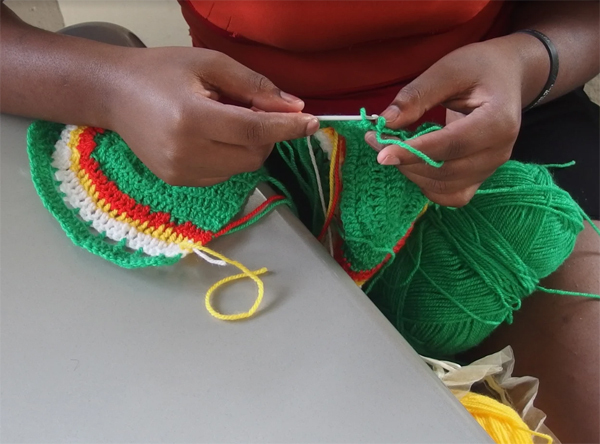 In December, Luci taught a crotchet workshop for the girls of Mary’s Child, Mustard Seed’s home in Kingston for teen mothers. The workshop was taught as a practical skill, creative outlet, and way of earning income for these residents. MSC: What made you interested in doing a workshop for the girls at Mary’s Child? LW: I knew I wanted to run workshops for women after reading about Mary's Child, it seemed like the perfect fit. Crochet can have many functions. It can be a therapeutic and social exercise, a creative outlet, a practical skill and also a way to earn an income. For the girls at Mary's Child I thought it could be a useful skill to have—an ability to make things for their children and perhaps down the line a way to earn a little money. MSC: What did you cover in your workshop and how did the girls respond? LW: I began with the basics, like how to hold the yarn and hook to keep the tension, and how to chain, single crochet, and double crochet. Some of the girls became frustrated as they felt they couldn't do it while others were really determined and continued practicing in the evenings after the workshops were over. A few girls progressed really quickly and seeing their excitement and drive was amazing! It reminded me of myself when I was learning! For the girls that mastered the stitches, I began to teach them how to make a top, guiding them through the steps and explaining how to avoid common mistakes. Some of the girls then started making other items like bags, hats, and headbands. It was so nice to see them experimenting and working on their own designs! MSC: Why does the mission of the Mary’s Child home appeal to you? LW: I really admire Mustard Seed for setting up Mary's Child. I can already see how much it is helping these girls by being there. One thing I am passionate about is female independence—both socially and financially. I love the way that Mary's Child is teaching and guiding these girls into being self-sufficient and focuses on their education and future employment. MSC: What was your hope for this workshop? LW: I really want to make sure the girls continue practicing and experimenting with crochet as this is what will really help them progress. I hope that one day some of them will be able to sell their creations and make a little income! Yarn in Jamaica can be hard to find, expensive and not good quality so I'm going to try and fundraise some money in the UK so I can send over more materials for the girls. If anyone would like to donate, please contact me. MSC: Where can people find more information about you? LW: You can find out more about Knots & Vibes on the website, www.knotsandvibes.com, and also on the Instagram profile @knots.and.vibes, where I share regular images and updates. If you'd like to contact me, please email info@knotsandvibes.com.